First time FLOWER HOLI in Bangalore . Play holi with flower for those who dont like colors but want tto play holi, separate area for flower holi. Considered by many as the No1 DJ in India,DJ Suketu has been one of the highest selling DJs in the country with remixes like Bin Tere Sanam,Pyar Zindagi Hai. He was recently seen on top-rated Indian television show Jhalak Dikhhla Jaa with jury member like Remo D'Souza, Karan Johar and Madhuri Dixit on Colors, where he mixed live music for the contestant. Bangalore Most Popular Artist of Bangalore for Bollywood, Deejaying from past 20 years played in all Big festivals and Popular Artist . 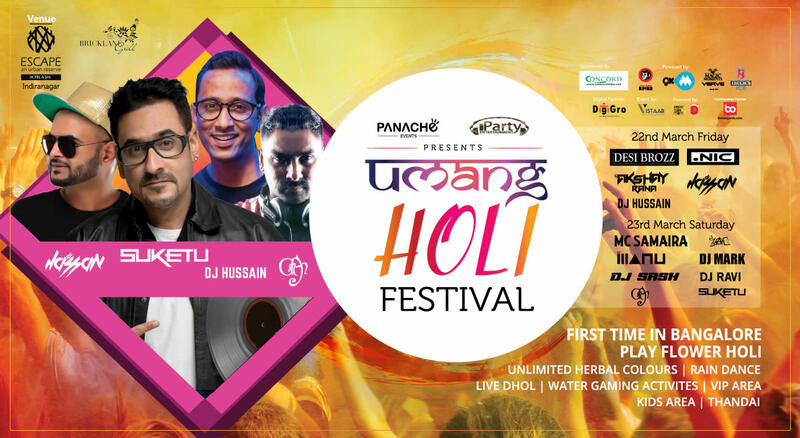 Dj Hussain Is playing on 22nd of march . DJ but also as a smart producer, arranger, remixer, event manager and above all, a wonderful entertainer. Being an international artist, Hassan has played in various music festivals and concerts in Doha, Sri Lanka, and Dubai.